Peter Lynch joined Fidelity in 1969 as a research analyst. In 1977, he took over the Fidelity Magellan Fund. The number of stocks in the Magellan Fund increased from 40 to 1400. 200 companies represented 66 percent of the portfolio. The Magellan Fund became the largest mutual fund in history and it had over a million shareholders. But the sad story is that not many made money by owning the fund since they often sold at the bottom of the market. In total, Lynch bought 15 000 stocks and analyzed 150 000 companies. To help him, he had Fidelity's research apartment, but he still made all decisions by himself. In 1990, Peter Lynch left the Magellan Fund. It had on average increased 29 percent each year. Compared with other investors, Lynch has written a few books on how to invest. The best book is probably One up on Wall Street - How to use what you already know to make money in the market. The subtitle is important. Lynch believes that someone who is not connected to Wall Street can make better investment decisions if he/she invests in what he/she already knows. So if you work at Tesla Motors or bought a Tesla car, then you will be a better investor in Tesla than the Wall Street analyst. If you work in Tesla's factory, you will notice if the factory is manufacturing more or fewer cars. You will notice that before the Wall Street analyst who will not notice that until Tesla releases a quarterly report. Invest in companies that exhibit signs of above-average growth, even if the share price appears expensive in terms of metrics such as price-to-earnings or price-to-book ratios. Small, aggressive new enterprises that grow at 20 to 25 percent a year. It sounds dull - or, even better, ridiculous. It does something dull. Lynch's example from the book of a dull company is a company that makes bottle caps. Cars are not dull and it's common to see Tesla in newspapers and television shows. Because of the dull business, a CEO from a dull company makes less public appearances than the CEO of Tesla, who is visiting television shows like Letterman. It does something disagreeable. People are generally not positive to electric cars. It's a spinoff. Tesla is not a spinoff. The institutions don't own it, and the analysts don't follow it. Tesla is a popular company among analysts and news from the company is often on the front page of large newspapers. The rumors abound: It's involved with toxic waste and/or the mafia. There's a rumor that electric cars can catch fire and are less environmental friendly than gasoline powered cars. There's something depressing about it. It's a no-growth industry. The US car industry is not growing - it's actually falling because young people are not interested in cars and everyone can't afford cars because of the bad economy. It's got a niche. Tesla is only selling electric cars. Other car manufacturers are selling mainly gasoline cars and maybe one electric car. People have to keep buying it. Lynch says that he prefers soft drinks compared with toys because toys are often popular for a short time. It's true that car buyers tend to buy cars from the same brand as the car they are driving. It's a user of technology. Elon Musk is also the CEO of a rocket company called SpaceX. Tesla has used rocket technology to build Model S.
The insiders are buyers. According to insider-monitoring.com, the total value of stock buying in Tesla since 2005 is $160 million, and the total value of stock sales is $232 million. The company is buying back shares. Tesla is not buying back shares because they reinvest all profits in the company to grow faster. The p/e-ratio. Is it high or low for this particular company and for similar companies in the same industry? Tesla doesn't have a p/e-ratio because the company is not yet profitable. The record of earnings growth to date and whether the earnings are sporadic or consistent. Tesla's earnings per share has improved. Don't forget that it's important to look at the overall trend when you are looking at these key metrics. Whether the company has a strong balance sheet (debt-to-equity ratio) and how it's rated for financial strength. 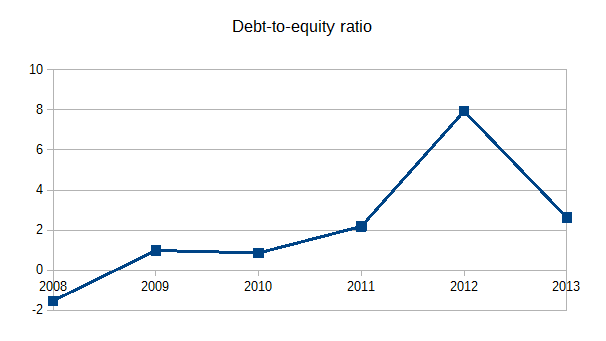 The debt-to-equity ratio has improved. 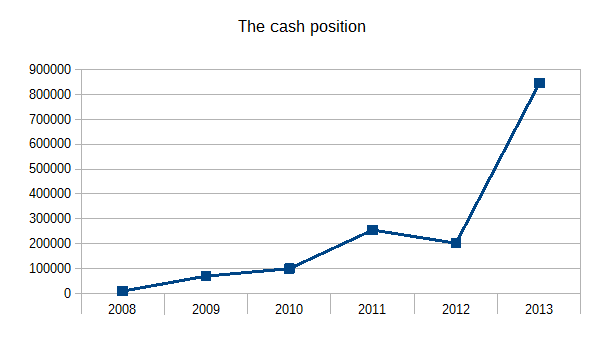 The cash position. It's a sign of prosperity of the cash position has improved and it's favorable if the cash exceeds the long-term debt. Investigate whether the product that's supposed to enrich the company is a major part of the company's business. We are interested in the entire company - not just the Model S or the Roadster. 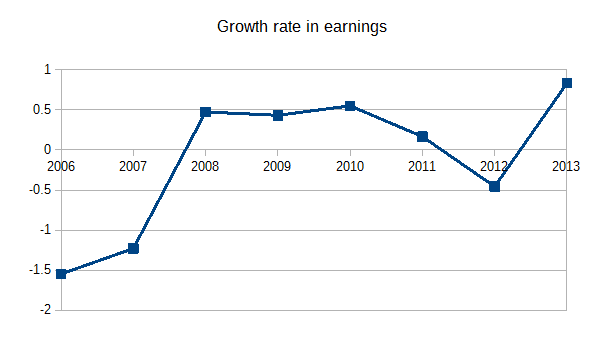 What the growth rate in earnings has been in recent years. Lynch's favorites are the ones in the 20-25 percent range. Tesla's revenues are growing with much more than 25 percent (83 percent in 2013). Lynch says that you should be suspicious of companies with growth rates of 50 to 100 percent a year. That the company has duplicated its successes in more than one city (or country), to prove that expansion will work. Tesla has successfully expanded from US to Europe where Norway has become the biggest market per capita. That the company still has room to grow. Tesla believes they will sell at least 500,000 cars per year and they are currently selling around 20,000. If we are going to replace the entire world's fleet of gasoline cars, then Tesla has room to grow. Whether the stock is selling at a p/e-ratio at or near the growth rate. Tesla doesn't have a p/e-ratio because the company is not yet profitable. Whether the expansion is speeding up or slowing down. The expansion has to speed up if Tesla is going to sell 500,000 cars per year. But it's difficult to say if it's happening because the car that will sell in large volumes, Model III, is not finished. It's better to miss the first movie in a stock and wait to see if a company's plans are working out. But don't forget that the final decision is up to you!